Is the $75m a done deal? 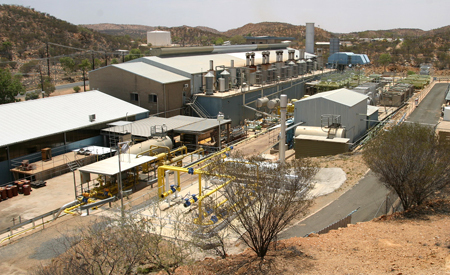 The Chief Minister will not disclose whether the $75m for a new gas fired power station in Alice Springs is already irrevocably committed in contracts with providers. In this case the massive public debate that has erupted, for example, whether much or all of that money should go to solar or other renewables, would be a waste of time. Also being discussed are the pros and cons of locking the town into electricity generation using fossil fuel for a long time, being dependent on a monopoly supplier, and the use of wind power. Readers have speculated that for that price, almost every house in Alice Springs could have been fitted with a photo-voltaic plant producing all the power needed. Others have suggested the merit of state – private partnerships. The $75m project did not see the light of day until it was disclosed by the Alice Springs News Online on February 2 this year, three days before it was officially announced, with fanfare, by Mr Giles. Since then there has been spirited public discussion on the issues, including (so far) 24 reader’s comments responding to the announcement and eight more in reply to a statement from the environmental group, ALEC. The Alice Springs News Online asked an aide of Mr Giles (who had made the announcement) more than 48 hours ago whether the $75m has been irrevocably committed. All we were told so far is that “Territory Generation are getting you a response”. They have not. PHOTO: The noisy Ron Goodin power station near the Golf Course Estate is overdue to be shut down. @ Steve Brown: Can you provide a list of the successful tenderers for the installation of generators. Also, how is this going to reduce the power price? Will we we require new power lines as the ones which I saw at Owen Springs power station looked a little flimsy to be able to provide power to the whole of Alice Springs. Will this also have enough capacity for the future growth of Alice Springs. People have been very uninformed about this, except that we are to spend $75m. @ Steve Brown: I don’t support any political party. You say you have no idea whether or not your own family business tendered for any contracts to build the new power station. You did know when the tender process ended and made a public statement about it. Given that you are running for public office do you feel that the impression your statements make are within the expectations on politicians to completely separate business and political interests? @ Steve Brown: There is no breach of our editorial policy of allowing pen names. This is in place because many people are afraid they will be victimized when they speak their mind. This is deplorable in a democracy, and I’m sure you will do your best to put a stop to it if you are elected to Parliament. In the meantime we will not be denying the freedom of speech to people wishing to make a point on issues in the public interest. We have their email addresses but will of course not disclose them. Be assured that quite a few comments, from “hacks” of a variety of parties, do not make it through our moderating process. It’s of course your choice to whom you reply and when. As we point out to our correspondents, the comments from people using their full names, such as you always do, have a far greater weight than those from people providing merely a pseudonym. George: My family, friends and associates who make up a big part of this community, tender on virtually everything! As to whether they did or did not on this occasion I have absolutely no idea! However clearly they like all Alicespringites will benefit from the boost to our economy this fantastic project will bring. Clearly the intention of your comment is to cast aspersions that somehow there is something shady in that. I can assure you that procurement is a process subject to the highest standards of governance, on each occasion outcomes are heavily scrutinized by all the competing parties. Further to that, winning a government contract is not like winning a raffle! Its not a gift! You actually have to undertake the work nearly always at great risk to make a dollar, if you are lucky! Editor, do you really think accepting comments from party hacks using assumed names taking cheap shots is in line with your published editorial policy? I am happy to participate in your comments section answering genuine questions from persons using their own [verified] names. When I get the time! I simply do not have the time to engage with Opposition party hacks whose only intention is disinformation! I have replied on this occasion because you asked me to. Janet is clearly not up to date on the latest advances in battery technology, or molten salt heat storage etc. Batteries do not come into this topic. Brewer Estate has a coupla near new gas fired generators. They can keep chugging through the night for another 20 years. What we need is a green light that solar will have an important role. This decision is a red light. DO NOT invest in solar because the NT Government is putting all its money on fossil and will need to distort the market to get its return on investment. Oh, so disposing of batteries is difficult and potentially have too much of an environmental impact. I guess that means we are against the nuclear industry and the waste that creates. @ George: What is it with some men that believe that they have the birth right to an opinion? Welcome to the new world where women have the right to express their opinions. @ Jimmy: The elephant in the room is the batteries. The wind power and solar the greater the threat to our planet by the non recycled product of batteries. Battery disposing is a national environmental catastrophe. @ Janet Brown: I’ve noticed a pattern of you responding whenever Steve Brown gets himself in hot water. This has become so common I was waiting for your response given that Steve may have put his foot in it again. On another current story here Steve was outed for his CLP line overblown stats on the Sentenced to a Job prisoner rehabilitation program so he went offline and you took over. Now you have stepped in again. I have to say that this pattern does not endear me to Steve, I won’t be voting for him. We know for a fact that the burning of fossil fuels is creating greenhouse gas pollution and contributing to global warming. Recycling of batteries is an industry in itself and hopefully as the technology matures, so do does the minimising of environmental impacts. Territory Generation, the Treasurer and the Chief Minister need to come clean on the decision-making process that lead to the front page announcements a couple of weeks ago. The Arid Lands Environment Centre continues to push for full disclosure of the tender documents and the decision-making process that lead to this flawed announcement. Alice Springs has the potential to be a world leader in developing a renewable energy grid with gas back up for those cloudy days. It is hoped that commonsense will prevail here and instead of locking Alice Springs into a fracked gas future, we can look forward to a modern, 21st century electricity system that supports long-term jobs through creating a new sustainable industry. This is the future our members and supporters are calling for and are vowing to step up the pressure if this is considered a done deal by the CLP government. We have advanced technology in anything but batteries to store the power. Have we got the technology to provide good environmental practice in disposal of the batteries, or how to recycle to reduce the impact of the highly toxic batteries? The answer is no. So until we have do we should stick the the next best thing – gas. No worries re waste disposal. A clean burn. @ Steve Brown: Can we assume from your lack of response that you or a member of your family have tendered for work on the new power station? Business and politics must be separate and be seen to be so. Do you understand that imperative? Disappointing … @ Steve and @ Adam. It would have been good to at least an explanation as to why there wasn’t some local discussion prior to this out of the blue announcement. A portion of the cash could have been allocated to solar, surely? Could have been the best of both technologies. I really hope it is not a done deal. The spend is great news – $ for jobs and infrastructure is just what we need. Fossil fuel infrastructure investment however, is a disaster. We need investment in renewables if we are going to see our town remain viable in the future. @ Steve Brown: Has your family tendered for any contracts to participate in the construction of the power station? Steve, I know for a fact that in years past, members of your very own family have been awarded a construction tender – only to have it cancelled due to internal government reasons. Of course, some type of compensation is paid – but it’s never too late. Seems a bit underhanded that the new generator would be built without public input. I have questions about the viability of a 100% solar town when we have week long rains, but I would have liked to see some modelling. The ACT government is going to spend money to have 10,000 houses in Canberra fitted with batteries to test the large scale application. This is done through the government owned power utility. I would have thought there was a role for such a plant here. For those who don’t know: Steve Brown is the CLP candidate for Araluen. He was with Mr Giles when he made the announcement about the $75m project. In the absence of any reply by Mr Giles and Territory Generation, we regard this as an official statement on behalf of the NT Government. I thought I made it pretty clear in comments to the previous story that this project is underway! The tenders already let! Far too late for any alterations!